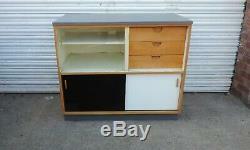 Vintage retro kitchen units Kandya Formica Plywood Heals 1950s Frank Guile 1960s. 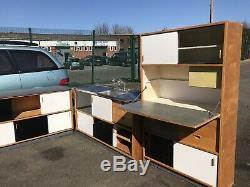 Very rare early edition complete kitchen by kandya designed by Frank Guille. Trimma units iconic units first modular kitchen available from high end retailers. This has original Heals label alongside the kandya labels. Kitchen includes hard to find tall larder and never seen one with its original sink great looking atomic taps. Great original colour of the birch ply. Doors have gloss black and White Formica g rey Formica work tops. 4 kandya wall units also available. 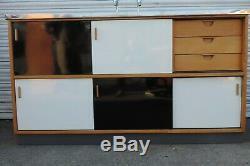 1 tall unit 2 door with shelves 32 cm deep x 175 tall x 54 cm wide. 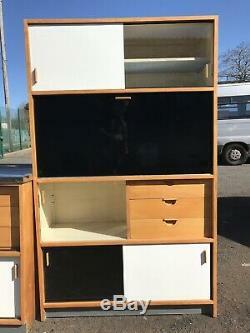 5 door unit with drawers 54 cm deep x 90 cm tall x 158 cm wide. 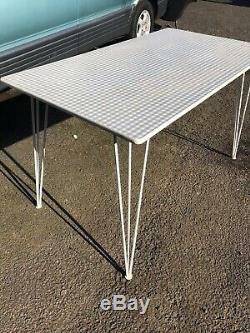 Small unit 2 door 54 cm deep x 90 tall x 56 cm wide. 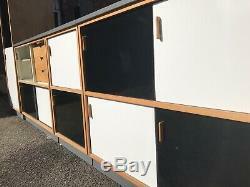 4 trimma unit 3 drawers 54 cm deep x 90 cm tall x 104 cm wide. 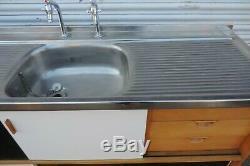 Sink unit 54 cm deep x 90 cm tall x 160 cm wide. 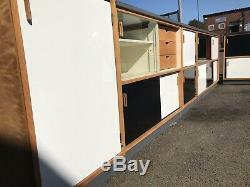 Larder unit drop down door 30 cm deep x 175 cm tall x 107 cm wide. 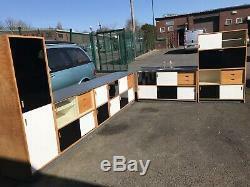 X 3 wall units available also 30 cm deep x 60 cm tall x 100cm wide two sliding doors. 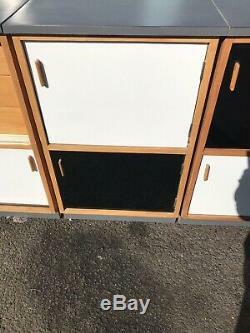 The item "Vintage retro kitchen units Kandya Formica Plywood Heals 1950s Frank Guile 1960s" is in sale since Monday, March 25, 2019. This item is in the category "Antiques\Antique Furniture\Cabinets\20th Century". 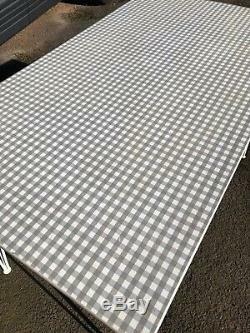 The seller is "leaping_lad" and is located in nottingham, nottinghamshire. This item can be shipped to all countries in Europe.